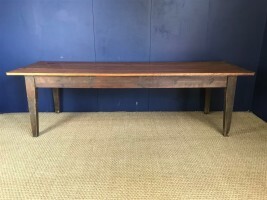 A large 9 foot Victorian pine farm table circa 1890 to seat 10-12 people removed from a local Dorset farmhouse in excellent solid condition with good legroom at 25 ins to the frieze. 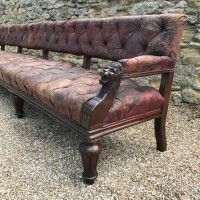 An enormous Victorian mahogany country house billiard room sofa circa 1880 in Regency style with the original red leather button back upholstery. The end arm supports carved with lion masks. 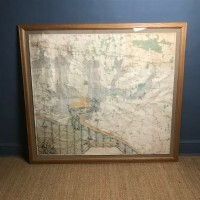 144 inches long 38 inches high. 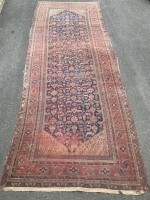 A large Afshar Kelleh corridor carpet . SW Persia circa 1890. A large Afshar Kelleh corridor carpet . SW Persia circa 1890. Country house condition but with even wear all over and not holed. 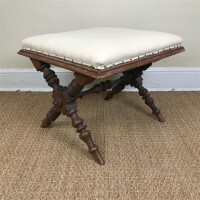 A nice large carpet with a good look and lovely design . Read more: A large Afshar Kelleh corridor carpet . SW Persia circa 1890. 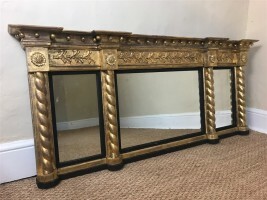 A Regency gilt triple plate over mantle mirror circa 1820. 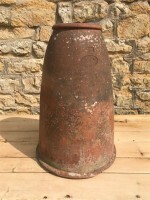 52 inches wide 24 inches high. Read more: A Regency gilt triple plate over mantle mirror circa 1820. 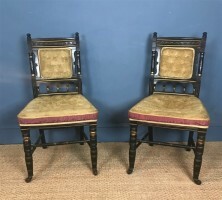 A pair of Aesthetic Movement ebonised and parcel gilt side chairs circa 1880 in the style of T E Collcutt with the original satin and velvet upholstery. 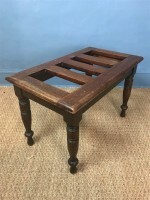 A small late Georgian pine pot board dresser circa 1830 in the original paint . 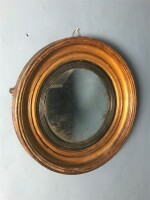 A George IV Convex Mirror circa 1830 in lovely original condition. 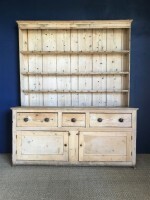 A large late Georgian Dorset pine country house dresser circa 1830 of good proportions bleached out naturally over the years to the colour of old bones. 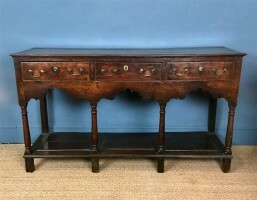 A small Montgomeryshire oak pot board dresser circa 1780 in lovely original condition with a beautiful colour and depth of patina. Original brass swan neck handles. 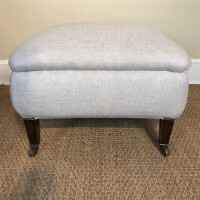 An Edwardian upholstered stool circa 1910 in the style of Howard and Son on square tapering mahogany legs brass cappings and casters. Completely reconditioned and recovered in cotton linen union. 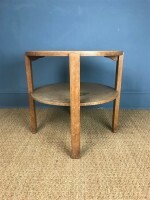 24 inches wide 24 inches deep 17 inches high. A Victorian mahogany country house sofa circa 1890 in good solid condition with beech frame on turned legs and brass castors with good underlying upholstery ready for recovering. 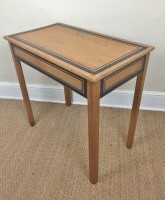 A matched pair of Dutch mahogany jardinieres circa 1830 with the original brass liners in excellent solid condition . 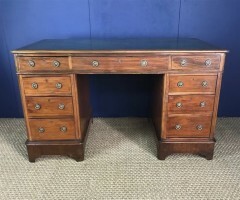 A late Victorian mahogany desk circa 1900 in the Sheraton style with the original red leather on square tapering legs. 40 inches wide 32 inches deep 27.5 inches high. An Edwardian oak hall cupboard/wardrobe circa 1910 in the style of Sir Edwin Lutyens with a lovely dry biscuity colour. 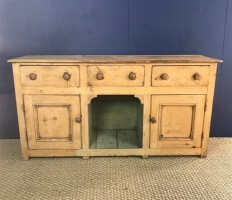 A Howard and Sons oak linen cupboard circa 1900 with fielded panel doors below two drawers revealing an interior with 4 pull out trays . Stamped Howard and Sons Berners St to the top of the RHS side drawer and bearing an ivorine plaque similarly inscribed to the inside of the drawer . A late Regency Irish gilt triple plate over mantel mirror circa 1830 with original gilding and silvered mirror plate.